The Berkeley Arts Council has announced a full array of art workshops and classes covering a range of introductory to advanced topics. Workshops begin January 10 and classes begin January 19. Workshops are usually one day and provide a basic overview of a medium or technique, or boost your creativity in a collaborative environment. 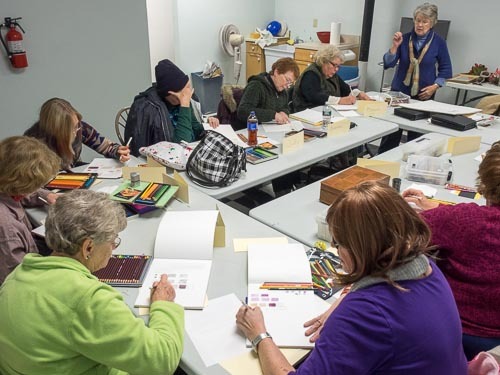 Workshops offered include introductions to pastel, color pencil and watercolor pencil painting as well as a “Spiritual Creativity” workshop, an evening scrapbooking workshop for moms, tempera painting for adults and more. For a complete list of workshops with details and online registration, visit artworks.berkeleyartswv.org/workshops/. Classes run 4-6 weeks and vary with 2-3 hours per session. Classes provide more in-depth coverage to a medium or technique, with time to develop your project during class. 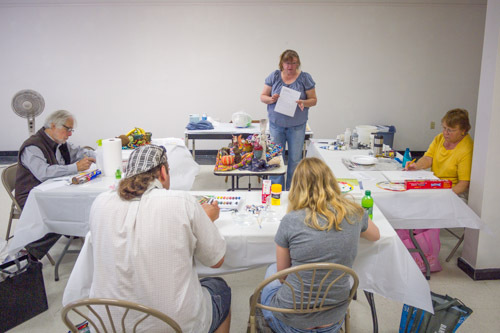 Jean Kellogg and her students during one of her acrylic painting classes. Classes include beginning acrylic, oil, pastel, colored pencil, and watercolor pencil painting, intermediate acrylic painting, advanced drawing and an introduction to portraiture. Also offered is beginning acrylic painting for home school students. For a complete list of classes with details and online registration, visit artworks.berkeleyartswv.org/instruction/. All classes and workshops are held at the Berkeley Art Works, 116 North Queen Street in Martinsburg. For more information email berkeleyartswv@gmail.com or call 304-620-7277.